Today, we live in a society that is image-conscious, one that is always in pursuit of the 'perfect figure'. Undeniably, a lot of people regard a slim shape as beautiful. Anything in excess is ugly. Many health experts exhort people to watch their weight, and this is already a global concern. There are several slimming methods that are available; some are effective, while others are believed to give more damage rather than benefit. There is one, basic knowledge that a dieter has to know before deciding to embark in any of those diet programs. Weight loss can be planned. First, one has to know 'how' to calculate certain things that could affect a person's weight. And just like any other formula, it has many factors. We begin by knowing the factors: height, weight and calories. One needs to know how much calories is needed to be able to maintain an ideal weight. Once the caloric need for a day is established, computation can follow. Lowering the number of calories means loss of fat. Now that we know the calorie requirements, it is also imperative to know the foods that are rich in calories and the level of physical activity to be able to successfully equate the length of exercise time and then be able to 'do the math'. Mild Physical Activity- people under this category should exercise 3 times in a week, at 20 minutes each time. Average Physical Activity- there should be a 30-60 minute exercise at 3-4 times in a week. Heavy Physical Activity- 'labor'-centered occupations such as masons, carpenters and farmers fall under this category. 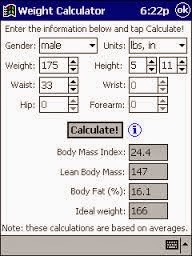 The BMI Calculator is used to calculate the body mass index. You will be able to know if your weight is normal, if you're overweight or is suffering from obesity. This is by measuring the weight in relation with the height. The result is the total body fat which is a close estimate of the actual figure. When BMI is excessive, then the person is at a high risk on diseases. BMR/RMR Calculator is used to know the amount of calories that is being burned in one day which is based on levels of activity. The Activity Calculator is much like the BMR/RMR for weight Calculator because it measures the amount of calories burned in a 24-hour period. BMI = Weight (kilograms)/Height (meters) x Height (meters). If the BMI is less than 18.5, the person is underweight. Anything that is greater than 27.5 is obese.